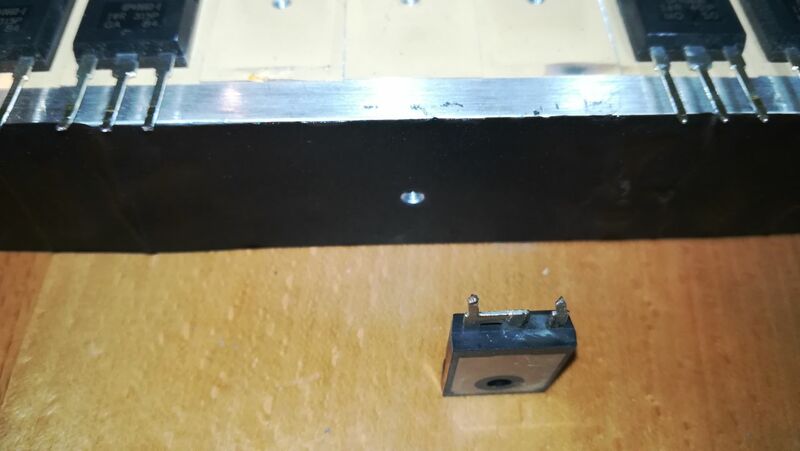 There is a special-order model of the PIP-4048 that allows up to 64 V of charging, if you think you really need to go beyond 58.4 V. I don't know anything else about it, not even a name for it. I assume it has different MOSFETs and higher voltage capacitors, and different firmware. The attachment is from http://www.voltronicpower.com/oCart2/in ... uct_id=132 . I dont want reach 64V but only near 59.4V . But I dont want crah mosfet or capacitors. I've updated the list of parallel compatibility groups. From this graph you can see that Volts sits about 130v until about 10am the mppt/charging kicked in. Hi Alan, If your connector issue was difficulty in getting MC4 connectors apart, I note that a 16 mm (or 5/8") open-end spanner works well to compress the barbs and allow them to come apart. Much better than fingers (too fat to fit in the notches), and much better than pointy nose pliers (jaws not parallel). But even with the spanner compressing the barbs, it can take a lot of pulling and wiggling to get them apart. I turned the solr back on and as you can see the V went back to about 125v and the relay just clicks away again. Given the OC volts is well below max of 145v is it possible there is some issue with the pip? I'll be adding some more panels soon so I may have to wait to do the string mod test. It does seem that your PIP is more sensitive to high voltage than is claimed in the manual, but for all I know, they may all be like that. What are your U1 and U2 firmware version numbers? But no matter whether the PIP is out of spec or not, there is no doubt that the optimum number of 72-cell panels in series, for a PIP-4048MS, is 2. Please just do the experiment. I finally changed the strings this morning to 2 strings of 2 panels was 2 strings of 3. The problem persisted with the relay clicking away. After approx an hr the charging started. Have a problem with 72.70 the Max. Charging Current setting has become a max current setting for solar charger so if you set it at 30amps that is all the solar charger will put out instead of being max charge to battery. Only found this out because I loaded them up to 4500watts and was getting a battery discharge then saw that only 30amps of total PV was there. Two pips in parra with 225ah of LA flooded. OK. So now we know there is definitely something wrong with your machine. This is definitely not expected behaviour. My next suspect is the relays in the SCC. Maybe their contacts are badly burned and making intermittent contact? It sounds like you have the Solar Balance parameter  set to Sbd. If so, you need to set it to SbE (the default). See the bAL  section of the AussieView manual or page 23 of the manufacturer's manual. I am really impressed by the amount of excellent information in this thread and especially at all the work done by Coulomb and Weber. This is forums at their best! Thank you! I have been asked by a friend of a friend who I designed and installed an LFP based off grid system for in 2013 if I would help him get an off grid system up and running. This thread has made me think that it might be worth considering using the PIP4048MS or maybe the 5048 rather than a separate charge controller and inverter from more mainstream manufacturers. I am considering the Victron Phoenix inverters and EPSolar charge controllers. 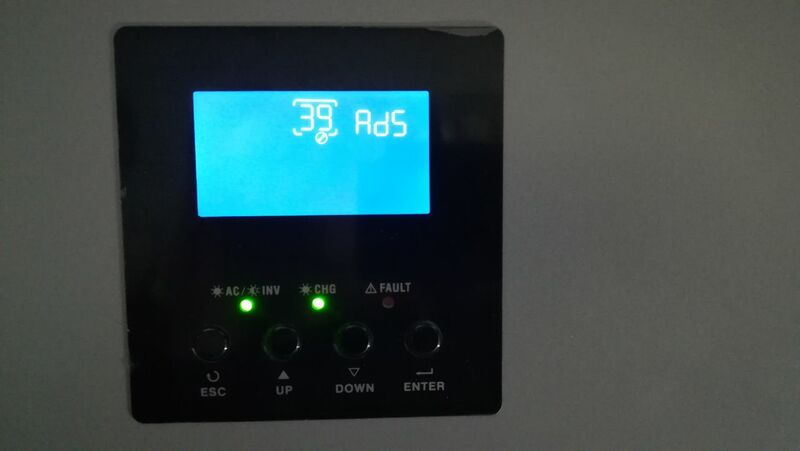 The price of the PIP4048MS makes it worthwhile buying a spare and all the information in this thread will make it easier to interface my BMS to the SCC and inverter in the PIP and fix it if there are any problems. My plan would be buy two units, run one for 3-5 years or until it blows up (hopefully not!) and then swap it with the spare. I would replace the main caps as detailed in this thread in the unit that I had swapped out. I was thinking of configuring the LFP battery as 15s rather than the normal 16s to drop the voltage a bit. Only issue I can see with this is that it will increase the current. Which is preferable, decreasing the voltage stress or increasing the ripple currents and component temperatures due to the increased current? I wanted to shut down the SCC via a signal from my BMS. Am I right in thinking that I can do this by sending a command to the PIP to raise the bulk and float voltages, or is there another way to do this? I also wanted to be able to shut down the inverter. After reading the thread a few times! I am not sure if this can be done by sending a command but is possible by simulating the On/Off switch on the PIP being turned off, am I right? Hi Simon, I've had success with the 15 cell arrangement charging via a PWM controller using nom. 12v panels (18v Vmp) in series. The 24v units come in 5000va (4kW) models and they don't seem to have current rated issues so I can't see the 48v model having issues. The days of needing high voltage battery packs to reduce the current requirements really date back to the lead acid battery days, using LYP cells where high current draw is not an issue the days of requiring the use of a 48v battery pack and charging components might really be a carry over rather than a necessity. I recently installed a 32 x 200Ah cell battery (4p8s 24v) with a 4kW PiP inverter and 5.6kW of solar and the system is out performing any and all expectations with none of the herding feral cats using Dingoes type problems the 48v systems seem to enjoy. Thanks for the great work you guys do, Coulomb and Weber. I updated my PIP4048MS to your latest beta firmware a couple of days ago. Not sure whether I needed it or not as I was running the latter version. You can see a graph of your beta 73.00a firmware at work at https://drive.google.com/open?id=1U7GgT ... pzOlgMBowp, it works well. Can also view my PIP4048MS at https://emoncms.org/dashboard/view?id=33822 as is setup for public viewing. You can see how it goes into float mode at the right time. Does bulk charge followed by float mode even on cloudy days. No problem. 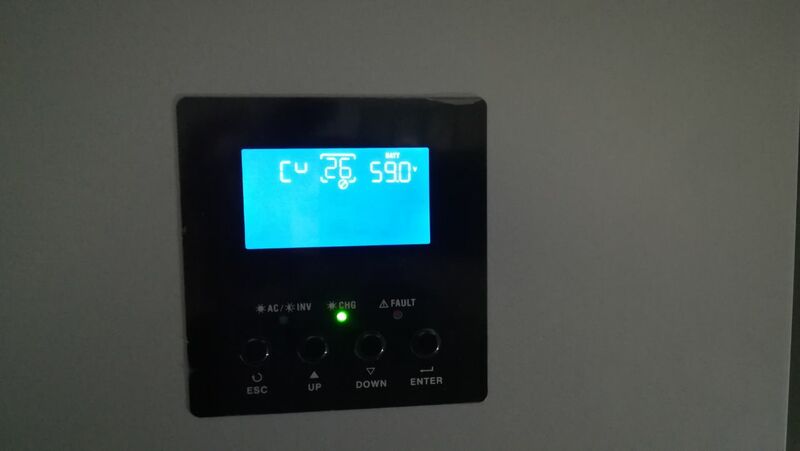 I like how my PIP4048MS LCD screen now shows the temperature of the unit... nice. You guys should try to get crowd funding for this.. Thanks for that, lopezjm2001. As we don't ask for money, it is kind words like yours that keep us going. I'm glad you like the "AussieView" LCD improvements. I'm surprised at how little feedback we've had about those. But we try to assume: "No news is good news". I have 72.70 running on the systems and the battery performance appears to be much better but note I also have the 9 panels with the e-smart3 as well. The battery is staying at a higher voltage for much longer while under discharge at night, the balance of the current from/to the banks is much better. 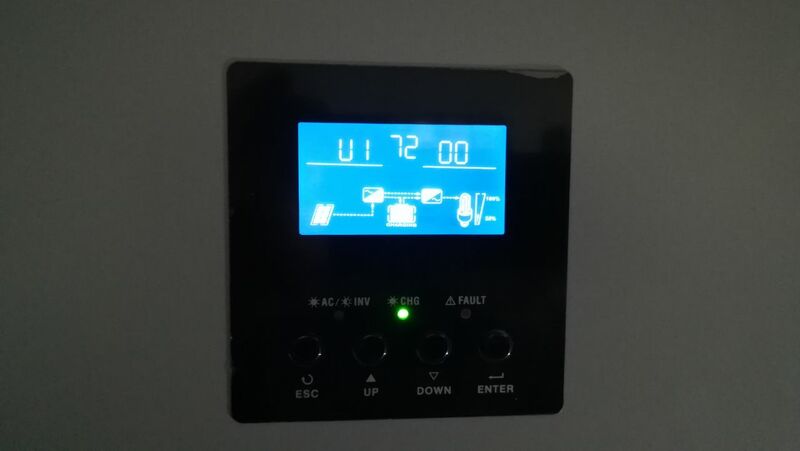 As a companion to the PIP the E-smart3 is a good match giving the extra 40amps to take solar to 100amps which gives the system enough to run the loads and charge the battery properly. I am going to try and find time to finish the remote display I started on which uses a dotmatrix LCD to display most of the parameters all at once from the QPIGS command. 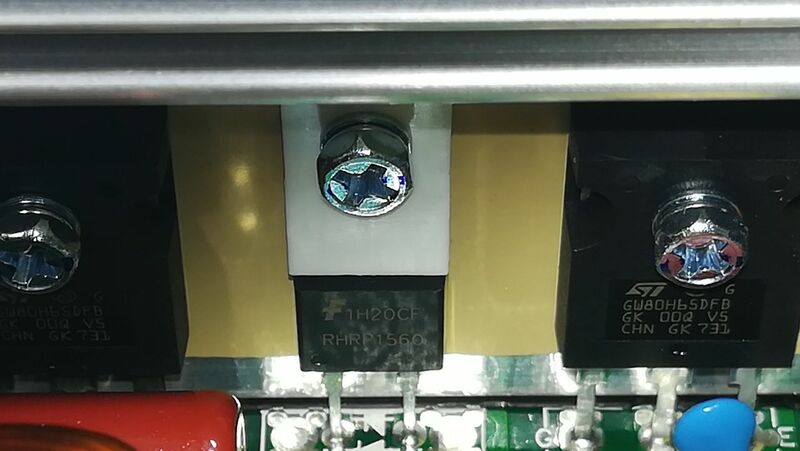 There is a special-order model of the PIP-4048 that allows up to 64 V of charging, I assume it has different MOSFETs and higher voltage capacitors, and different firmware. I have seen them through the grid of holes. I dont know if there are 16 or more. I cant watch capacitors.... I would have to open the device invalidating the warranty. A question about parallelized pips: If mosfets/igbts in one unit of the cluster fail, what happens in the other units of the cluster? Wow! So these are 80V MOSFETs with Vgs=0, but only 60V with Vgs=-20 V. The datasheet doesn't say what voltage is safe with intermediate gate voltages, but suggests (to me) that with any significant negative gate voltage, which I assume is standard, that the limit is 60 V. So there must be a non-standard gate drive for these. Or I'm misunderstanding the datasheet. I have seen them through the grid of holes. Well sleuthed! Maybe an optic fibre camera next? Is there a special firmware revision number? I imagine they would want to distinguish the high voltage versions from others, yet indicate what other features and/or bug fixes it has in common with the nearest non high voltage version. A great question. Firstly, I'll consider MOSFET failure. 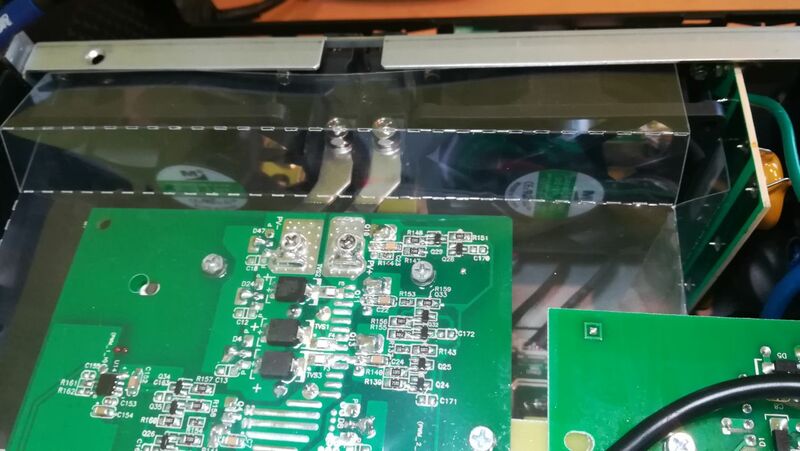 I assume that the battery is effectively shorted while the MOSFET leads (the real battery fuse) are melting, which would protect other inverter units in the cluster. But when the last MOSFET lead lets go, the voltage across the battery terminals to the other units would suddenly increase, and I imagine that there would be an inductive overshoot that would severely test the capacitors and MOSFETs in the other units of the cluster. This spike in voltage might or might not be enough to take out some or all of the other units. 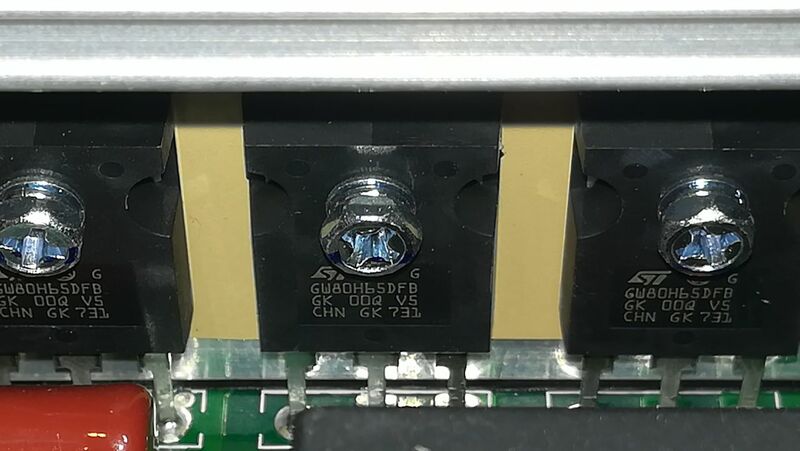 Secondly, if the IGBTs fail, then the 400V bus is shorted, which might or might not take out the MOSFETs of the same unit, depending largely on the health of the battery side capacitors (and probably also the health of the bus capacitors as well). This would happen via a surge through the high frequency transformer coupling the bus and battery circuits. This would then propagate or not through to the other units, as above. Does anyone have first hand experience of this? Working conditions: 1 pip4048 (master) manufactured August 16 (no heatsink on top) + 3 Axpert 5048 (4kW) (slaves) manufactured Mars 2014 (heatsink on top). Firmware 72.70c on all units. Lead Acid Battery 1500 Ah. At midday global solar production about 9 kW 160A (40+40+40+40 more less) to battery and a little inductives load in AC (2 kW). A little cloud effect.... not important. Suddenly ALL DC breakers of slave units OPEN. Only DC breaker of master closed but all units in fault. I disconnect everything. Two slaves shorted at battery side. One slave starts at fault 09 and shutdown. Master starts at fault 09 and shutdown. I only have dissambled one shorted slave: 12 mosfets shorted, 2 mosfets fifty fifty, and 2 mosfets correct. Buck IGBT (2) shorted !!! Any explanation of this disaster ?? 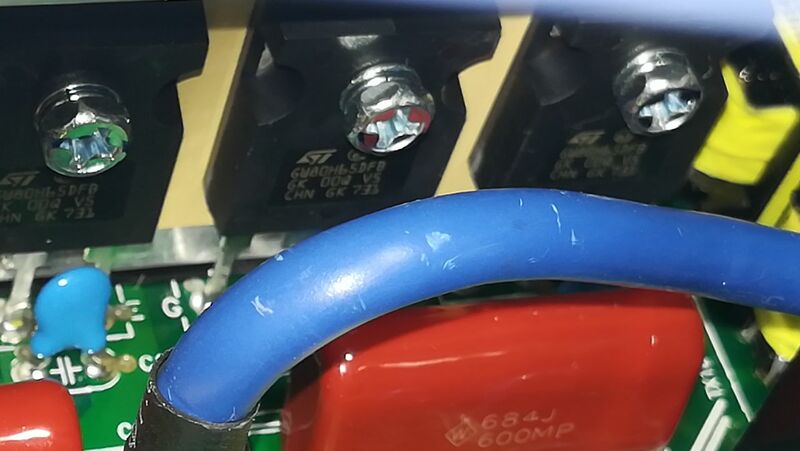 Mosfets and capacitor were original on failed units. Pd: Yes I bought an axpert 5048 pf1 64V until I repair failed units if I can. Hello guys I'm from Curacao, a small Island in the carribean sea. I've Learned a lot on this forum. After a lot of reading,Youtube and other forums. Ive decided to to order the PIP 4048ms Inverter charger. Ive got the 12-2017 model firmware 73.0. It Arrived yesterday and it is installed and doing its job. 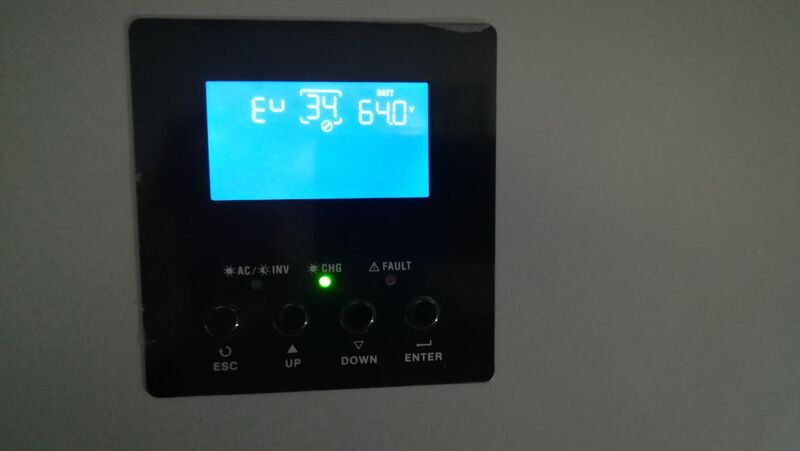 Ive 2kw of panels and a 400ah battery Lead acid connected to it, my only load for now is the AC of my room. 1kw of panel thru another charge controller and 1kw thru the 4048. Ive settings # 32 and so on, but cann't find what this mean in manual, please help. See page 23 of the online manual via the first link in our index post. Also see the link "Weber's table about parameter 1, Output Source Priority", in the index section headed "Parameters (LCD settings)". Thanks for the photos, Tejota. The SCC firmware is up to 04.12. I wonder what updates are in there, if any. New parameter Ev (34), is presumably the maximum tolerated battery voltage before you get an error. Nice to see that adjustable. The capacitors have changed from the originals with the gold colour; obviously the original 63 V models would not do. The IGBTs seem to be different part numbers, but that doesn't mean much. Working conditions: 1 pip4048 (master) manufactured August 16 (no heatsink on top) + 3 Axpert 5048 (4kW) (slaves) manufactured Mars 2014 (heatsink on top). I assume that the slaves would have been Axpert 4048s, being 4 years old now. So: battery voltage might have been near its highest. A little cloud effect.... not important. Well, it might be. Pips/Axperts tend to overshoot the desired battery voltage by sometimes over a volt for several seconds. Interesting about the buck IGBTs being shorted. That seems to indicate that there was a surge that travelled from the inverter circuit back to the battery circuit. So maybe something happened to the inverter of this slave, surge blow up MOSFETs at the DC side; the leads of the failed MOSFETs all fused open circuit (hence it was able to start up and show an error 09), and when the battery terminal voltage suddenly increased, the inductive kick-back sent a spike of voltage to the other three battery terminals, killing all their DC side MOSFETs (and possibly more). 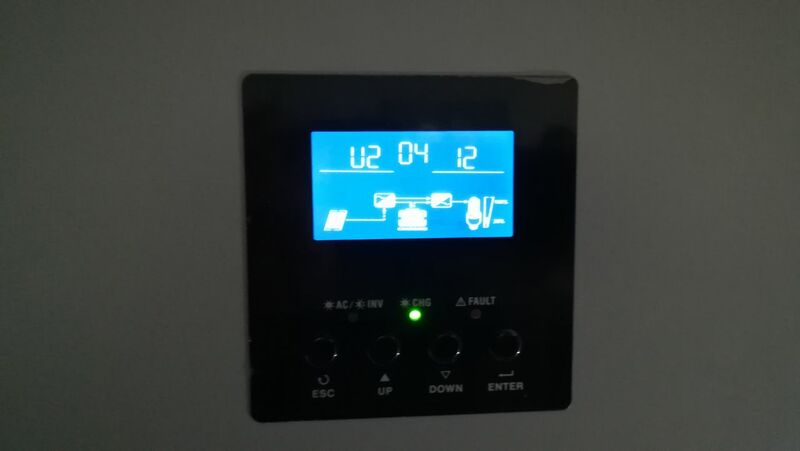 Summers in north east Spain are about 2°C higher than Brisbane Australia, and we've had inverters fail after a few years when the capacitors are factory originals. 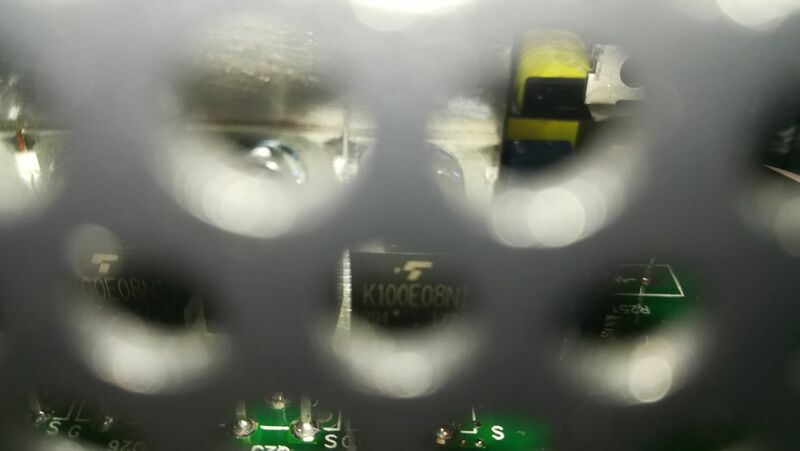 The factory capacitors are rated for only 2000 hours at 105°C, so Spanish summers would take their toll. So that's my guess. Ps: Yes I bought an axpert 5048 pf1 64V until I repair failed units if I can. 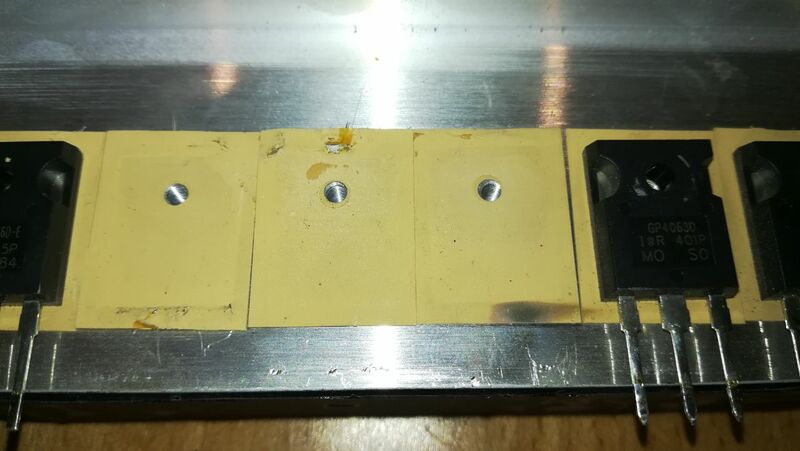 If you don't already have one, consider buying a desoldering station; it will be very useful for repairing 4 failed units. Weber bought one a while ago, and it's been wonderful for removing those endless MOSFETs, and sucking out solder from capacitor holes. Good luck, and don't forget to check out all those gate driver parts as well. [*] The SCC firmware is up to 04.12. I wonder what updates are in there. Allowing it to charge up to 64 V I presume. [*] New parameter Ev (34), is presumably the maximum tolerated battery voltage before you get an error. Nice to see that adjustable. [*] There is another new parameter (39), with no name at the left, and the present value is AdS. Do you know what this parameter is for? 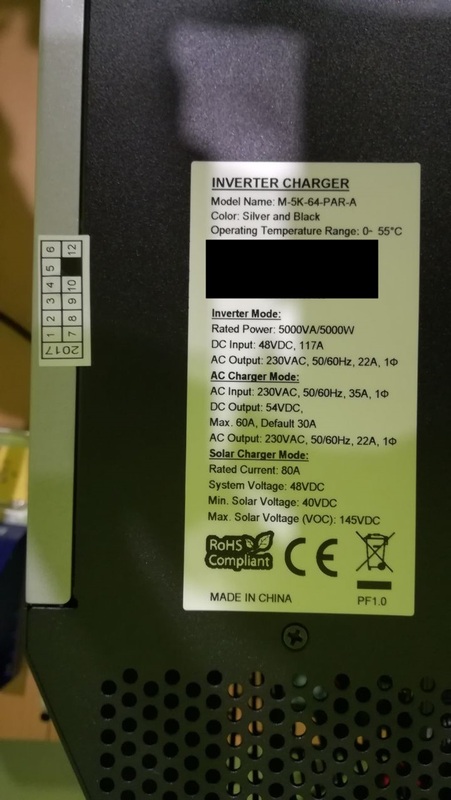 Did the inverter come with an up to date paper manual? RTFM (the second link in our index post) pages 23 and 24. Ev is equalisation voltage and AdS is activation disabled. Yes, the same as pip4048 old version, heatsink on top. Manufactured on Mars 2014 but in service from December 2016 (one year and two months working ). PIP4048 new version without heatsing on top (master) was working with slaves from December 2016 too. Yes, I have got one DESOLD STATION. Well, second slave has got too many MOSFET at DC SIDE shorted like the first slave. Not open circuit, only shorted. Q32 shorted (BUCK MOSFET) Q31 (BUCK MOSFET) not shorted. The same as first slave. IGBT Q27 is shorted in second slave. At first slave IGBTs are supposedly correct. Next days desoldering these parts on third slave and master. But IMO problem was overvoltage on freezer stop contacts relay travelling to PIPs AC LOAD. If Q31 or Q32 are shorted with D13 and some IGBT, too many MOSFETs at DC 48v will be shorted. Do you put the same ref parts number failed (D13, Q31, Q32 and IGBTs Q27 etc) ?? I have a number of AC voltage protection varistors here I am thinking I might put a bunch on the AC downstream of the inverters. 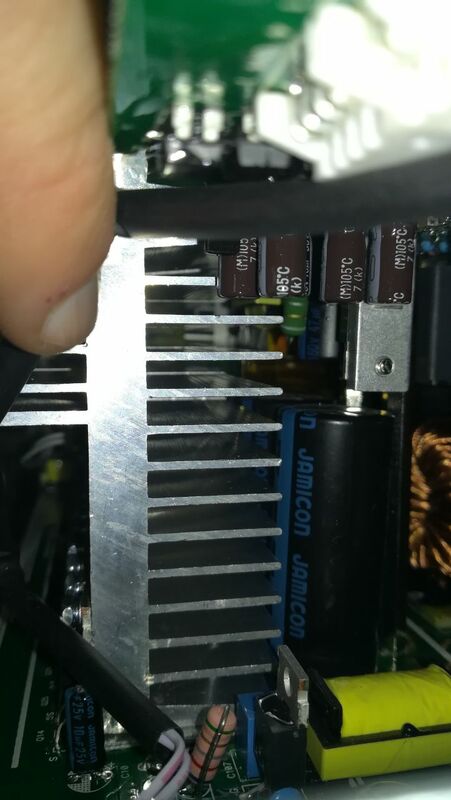 I think we need to keep the semiconductors and capacitors cool in the pips so fitting 120mm fans to the grills at the sides and inserting the temperature probe of one of the cheap on line digital controllers into the top of the 240v side heatsink (after putting heatshrink around it) is the way to go. I have done it and set the fans to come on at 42c then go off at 36c the highest I have seen on the 240v heatsink was 46c with the ambient temp about 10c below. Progress with the remote LCD display have most of the parameters of the pip displayed on the 64x128 Graphic LCD.